Trinity Laban’s leading student training company showcases dancers in three brand new works from established choreographers, in celebration of its 35th year anniversary. Transitions Dance Company’s 2017 triple bill showcases the next generation of contemporary dance performers from Trinity Laban with twelve MA students performing three brand new pieces from choreographers Cristian Duarte, Oded Ronen and Charles Linehan. Since its beginnings – founded in 1982 by original Martha Graham Dance Company member Bonnie Bird – this pioneering company has aimed to bridge the gap between training and a professional performance career for graduate dancers. Transitions Dance Company aims to allow company members to gain practical experience of life in a touring dance company whilst simultaneously completing their MA Dance Performance. Past alumni of the company include distinguished artists such as Sir Matthew Bourne (New Adventures), Luca Silvestrini (Luca Silvestrini’s Protein), and Emma Gladstone (Artistic Director and Chief Executive of Dance Umbrella). 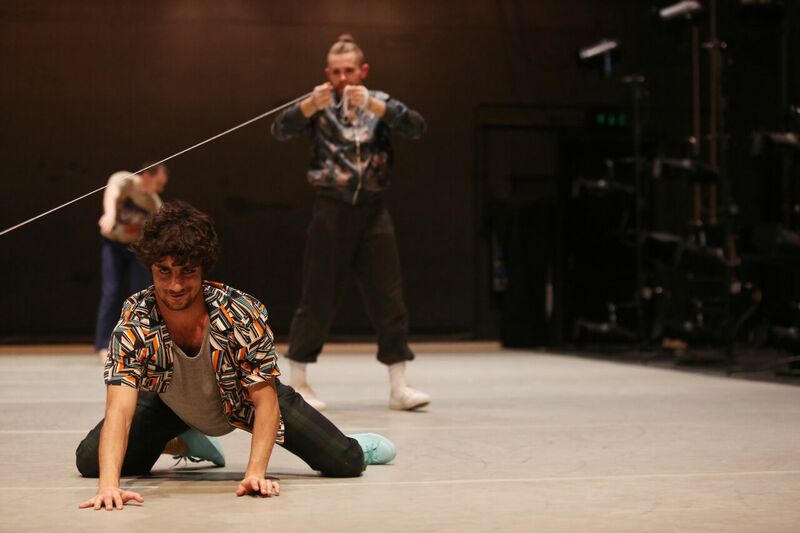 & from Brazilian-born and based choreographer Cristian Duarte breaks with traditional conventions, leading to the performers exploring a particular relationship with the audience. Humorous, bizarre, off-centre and all set to an arrhythmic electronic score by composer Tom Monteiro, the piece twists and turns like a river being navigated for the first time. Kintsugi is a touching and tender piece inspired by the Japanese art of the same name, involving repairing broken pottery with gold. Featuring new music from prolific dance accompanist Ronen Kozokaro, the dancers inhabit a broken, lonely and fragmented world, searching for reconnection and community. Nothing but Time has emerged from Charles Linehan’s research combining choreography and drone technology in which shadows become significant. Absorbed by their patterns of action and changing relationships with others, the performers move with awareness and intricate precision as if both bound by and unaware of time passing. Cristian Duarte is a Sao Paulo-based dancer and choreographer, who has been dedicated to research and creation in contemporary dance since 1994. He trained in São Paulo with Cia Nova Dança before graduating from Anne Teresa De Keersmaeker’s P.A.R.T.S. in 2002. Since then he has been developing his own projects and collaborating with artists from Brazil and many other countries. His work as a choreographer has been presented internationally and has been recognised by leading dance awards in Brazil. Oded Ronen is an Israeli choreographer and Co-Director of Humans in Motion (HIM) and works between Israel, Australia and Europe. He is the founder of Imagery in Motion (IM), a method straddling imagination and physics, placing emphasis on the human experience of both the dancer and the viewer. He trained at Bodyworks, Trinity Laban and Rambert before dancing for CeDeCe Dance Company (Portugal), Kolben Dance Company (Israel) and Fresco Dance Company (Israel). As a choreographer, Ronen has created works for HIM, Jerusalem Ballet, Albania Dance Theater, West Australia Academy of Performing Arts, Ochre Dance Company and XPATS International Project. Charles Linehan has created over 15 pieces for his own company and numerous national and international commissions. Charles Linehan Company has performed in over 20 countries and received commissions from Dance Umbrella, Royal Festival Hall, Joint Adventures, Dance 4 Nottingham, PACT Zollverein Essen, Danceworks (Toronto), and Danspace (New York). He has been Choreographer in Residence at The Place Theatre (London) and Joint Adventures (Munich). After living in Berlin for two years, he and his family returned to the UK in 2013 when he was appointed to his current position of Reader in Choreography at Trinity Laban. In 2015 he was invited to be an Associate Artist at Dance 4 (Nottingham).